Winter is coming. Over the weekend half of the UK woke up to snow and ice cold temperatures but I'm sure most of us didn't have to worry about finding somewhere 'warm' and dry to spend the night. Every now and then I like to use this blog and the voice I have on here to do some good and raise awareness surrounding important issues. Today that important issue is youth homelessness. People sleeping rough; single homeless people living in hostels, shelters and temporary supported accommodation; statutorily homeless households; and the ‘hidden homelessness’ which are people not recognised on national statistics such as squatters, and sofa crashers. Winter is only just beginning. The months ahead are only going to get colder and wetter. Could you imagine having to face the prospect of not having anywhere permanent to live comfortably and safely? Possibly having to spend long cold nights on the streets and dealing with all of the dangers and difficulties that go hand in hand with that? Imagine the emotional impact that has on a person, not to mention the health risks, both physically as well as mentally. That is why homeless charities and shelters are so important. 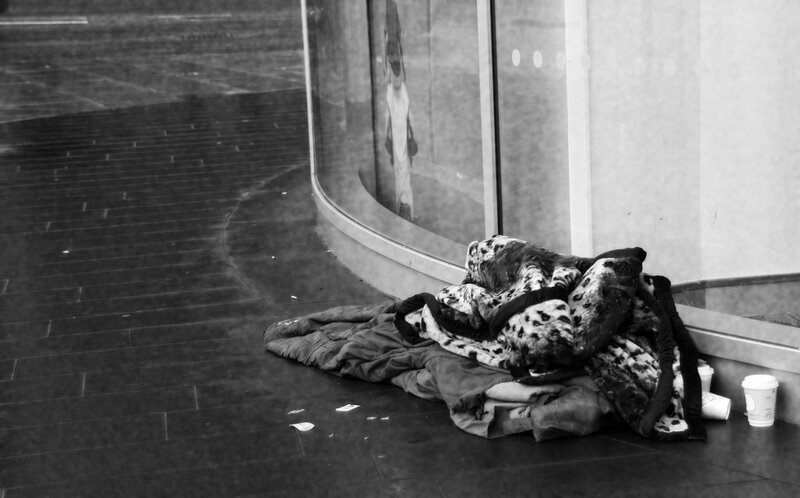 Organisations like Norwich based 'The Benjamin Foundation' who help to provide accommodation to around 100 vulnerable young people in Norfolk aged between 16 and 25 years old whom without the charity, could be faced with a life on the streets. Since I decided I was going to write this article, I have been discussing the issue of homelessness with other people and getting their views on it. The response I got back was often quite shocking. A lot of people I spoke to had such a serious lack of understanding towards homelessness, a lack of sympathy and maybe even worse than that, showed little interest or desire to help simply implying people become homeless as a result of their own actions. One person even saying that they deserve it. Not only did this upset me immensely, but their ignorance disappointed me. We need to look at the bigger picture and realise that every situation is different, but NOBODY deserves to be homeless. Every homeless person, and specifically here - homeless youths, have their own individual stories as to why they have ended up that way. There is no single reason why someone can end up without a home. Personal circumstances and wider factors both play their part, but for youths they often revolve their family having broken up around them and at some time in their life - maybe as a young child, maybe recently. Some may have been street homeless at some point in their lives but most won't have. Instead they have have been in children's homes, in B&Bs funded by the local authority or perhaps staying at a friends house. Not having a home can make it harder for individuals to live a normal life, find a job, stay healthy and maintain relationships. The Benjamin Foundation and charities like it give young homeless people a chance at life. They offer them crucially important help and support and build them towards being independent which means helping them with their education, training, jobs and life skills. That chance at life could change their lives and without that resource, you can only imagine what kind of dark path these young people may have had to face. A path which we must remember, sadly, is still being walked upon by those who are not so lucky, or those who have not been given the opportunity for a brighter future through such charities. We know that many homeless people will struggle with alcohol and drug abuse and crime. If we can potentially prevent that from being a young persons way or life, we are giving somebody a chance and I think chance is the key word here. Earlier this month, some friends of mine took part in a charity event called The Sleep Out. This is where people get sponsored to sleep rough in an attempt to raise vital funds and awareness for youth homelessness. Over 2000 people took part in 13 locations across the UK. It is a great opportunity to raise awareness and funds to support the work the charity does and the work that is being done surrounding housing and homelessness. We realise the event does not replicate what it is like to be without a home, but it does give a small taster. I couldn't take part for medical reasons but as an issue I feel is incredibly important, I wanted to still do my bit to help (hence this article.) In Norwich alone around £16,000 was raised. This is much needed money that will do a lot of good and I urge you to consider donating to The Benjamin Foundation - click here - or to your local homeless charity or shelter. There are many ways you can do your bit and get involved in helping the ever growing need for support. Fight the stigma, be the change. "The night started off fairly mild and the spirit in camp was brilliant. After about midnight the weather changed and it was absolutely freezing, we got rained on, had no cover and it suddenly got really windy. It was an amazing experience and it made me appreciate that I have a roof over my head." That for me hits the nail on the head. There are 80,000 known cases of youth homelessness in the UK. We are incredibly lucky to have a warm, dry, safe place to live and sleep. Something many of us take for granted. Appreciate what you have and remember not everyone is so lucky. Special thanks to The Benjamin Foundation and Jamie Minors of Minors & Co for contributing.